For most people, the majority of studying time is spent on things that require large chunks of time, such as going to class, reading books or talking with friends. These are usually not activities you perform for five minutes and then switch to something else. However, it’s possible to spend a significant amount of time on studying without actually letting it encroach on any other things you’re currently doing. In a way, this is a way in which you can magically expand the time available, possibly by a great deal depending on how efficient you were before. Diversified learning is useful for everybody, but especially for those of you who aren’t studying full time (if you do, you tend to get enough of studying as it is). Currently living in Sweden and studying English, I personally find that diversified learning is essential if I want to continue improving my Chinese. So what is diversified learning? It’s simply spreading out whatever can be spread out, chopping it up into so small chunks that they can be easily handled in between (or even at the same time as) other tasks. The old trick of writing things on your hands is a good example. It means that you might see a difficult character a hundred times over a few days, learning it without any focused effort being invested. This is just one example, and if you add up all the various strategies of diversified studying, it’s possible to learn significantly more. The rest of this post will be dedicated to explaining various ways of doing this, please contribute by commenting and adding your own tricks! Listen to recorded material – This is perhaps the most powerful method available. I listen to around ten hours of Chinese every week without even trying very hard. I listen when I walk to school, I listen when I cook food, when I wash the dishes, when I tidy my apartment and so on. Of course, I don’t listen very attentively all the time, but that’s not the point. I listen to anything: radio, news, textbooks, audio books. I have written a whole series of articles about improving listening ability, check the articles about background, passive and active listening. Use spaced repetition software – I’m probably going to stress this point until people get bored, but using some kind of spaced repetition software is essential but there are other choices as well. I usually have Anki running in the background on my computer, so when I’m waiting for a few files to copy or a website to load, I can review a few flashcards without interrupting anything else. Write difficult characters on your hands – We all have characters that just refuse to stick in our memories. 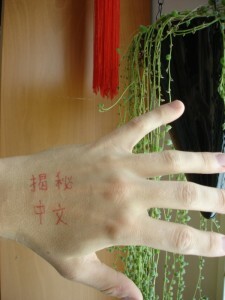 Rather than spending precious time studying them at home or in class, write them on your hands! Using a normal pen, they’re usually gone within a few days and by then you should know them. You can also write Pinyin and English if you want to. This is one of many methods to kill leeches. Tape/write difficult characters where you can see them – This is very similar to the above method, but a bit more versatile. Let’s say that you think it’s tricky to remember characters containing 莫 (like 模, 摸, 寞, 幕, 慕, 墓, 暮), well then, make a comparison of these characters using what you know about mnemonics (see the post about learning words and the article about individual characters). Put this comparison close to some place where you tend to have extra time, the obvious places being next to your bed, in the bathroom and in the kitchen, just above the sink. Use a smart phone and appropriate software – There are of course many ways to use smart phones to study Chinese, so it’s rather a platform than a method in itself. Most importantly, it allows you to listen to more Chinese (see above) and it also allows you to study flashcards while waiting for the bus (Anki has a version for smart phones). This means that you can spend the time at home by your computer doing something else. Changing languages – This trick is probably as old as they get, but changing the software language on your phone or computer is a nice way to become exposed to more Chinese. A warning is in place, however. Even though you will be able to use your phone in Chinese, you will need to be quite good at Chinese in order to learn how new functions work or to troubleshoot your computer. Make sure you can switch to English if you want to. I’m currently running my phone, computer (including Gmail, Facebook and so on) in Chinese. Taking notes – To practice writing, try taking notes in Chinese. This is obviously not a good idea when you’re in a hurry, but let’s say your going grocery shopping. Why not write the list in Chinese? If you don’t know all the words, skip some or look them up. Even writing words you think are really easy will improve your overall writing ability. These are just some examples of diversified learning, there should be innumerable ways to integrate Chinese into your life and make learning more efficient. This goal of this article was to get you thinking in this general direction rather than to point out every single possible variety. If you come up with something brilliant, why don’t share it in the comments? Thanks for this list, I find a good way is to just splash characters everywhere, I have a wall of post-it notes with a single character on each, so I have the pleasure of peeling it off once it’s stuck in the old noodle. You say that you listen to a lot of Chinese, could you reccomend the best places to find some audio/video I could slap on my IPod. Cheers. I mostly use audio from RTI (Radio Taiwan International). They have a broad variety of programs, so I get everything from discussions about gardening, teaching children to sing to financial news and political debates. I realise that not everyone is primarily interested in Taiwan, but in case you are, RTI is great. They also have more news with transcripts than you can possible consume. I will discuss sources more thoroughly later, but for intermediate learners, I think podcasts are excellent, but try to advance as quickly as you can to get rid of the English (if you’re using ChinesePod for instance). Wow these are some great ideas! I knew about listening to recorded material, tape difficult characters where you can see them, & taking notes, but I would have NEVER thought of writing the Chinese characters on your hands!